We've been offering vacation rentals since 2000. Please email or call Karen, the owner, to discuss availability. We can accommodate a 2 night rental during the week but have longer minimums over weekends. The homeaway system doesn't enable us to input this level of detail. We are located on the NV side of Tahoe. Please inquire for exact location. Dramatic, 4,000 sf estate with 6 bedrooms, 3 full baths, sleeps 19. Grassed front yard perfect for kids. Large staircase with thirty stairs down to the house, not good for elderly. - 520sf living room with12 foot ceilings, gas river rock fireplace and large screen tv. Other amenities include large hot tub, pool table, 2 gas fireplaces, 6 TVs, high speed internet, and large decks with gas BBQ and custom made outdoor dining table. Long staircase down to the house so not good for elderly. Beds include 1 king, 6 queens, and 5 twins. I first came to Tahoe in 2000 and fell in love with the scenery and activities. Over the past 16 years we've worked hard to provide our guests the best vacation experience. Centrally located with great lake views and lots of space. 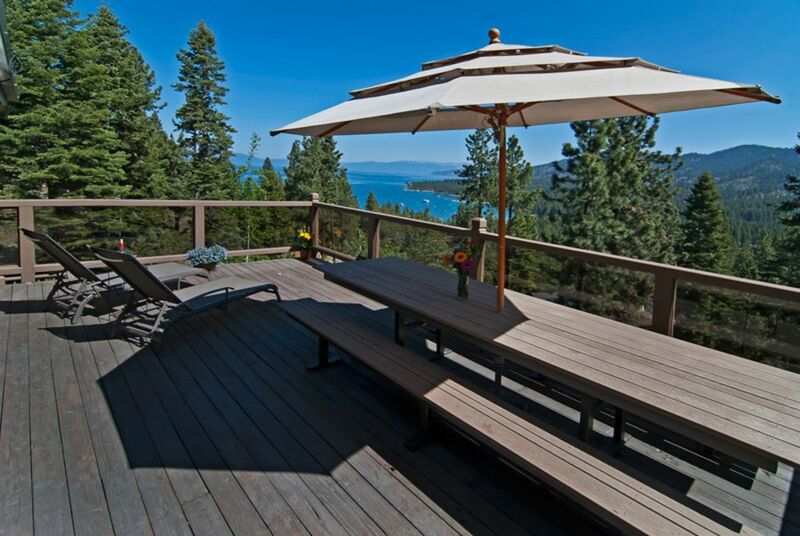 Close to the best beaches in Tahoe, casinos, and Heavenly ski resort. I lived in Philadelphia suburbs and saw this home in the internet and dreamed about it. 6 months later I bought it! It has a unique setting with front yard. It has great entertaining spaces. Panoramic lake views are amazing! 420 square foot kitchen with hard wood floors, gas fireplace, chandelier, and new granite counters and gas cooktop. (5) One Large screen in the living room, one in the kitchen/dining room, and 3 bedrooms have televisions. Large hot tub built into special wood hot tub room with large windows and slider to deck. 5 to 10 minutes to 3 beaches and downtown South Tahoe / casinos.